My initial thoughts after my first outing in the Geos was that they are actually a little too heavy for use in really hot weather. I also found that the proportions/sizing of these trousers didn't suit me very well at all. I'm 5'10" and was wearing waist=36ins, leg length=32ins - my normal trouser size. I walk a lot so it's true to say that my leg muscles are quite well developed. This may explain why I found that the Geos were a little too snug around my thighs. This meant the freedom of movement when squatting or lifting my legs was definitely restricted - which I would find of concern when doing anything other than quite low-level walking. In contrast, though, I found the waist band rather too generous - I could slip the trousers down without opening them! Although adjustable, I also thought the ankle cuffs were far too wide and were a bit of a nuisance in the wet. The Geos convert easily to shorts but I found that the zip-off point was rather too bulky and I was very aware of it all the the time. On the plus side, the fabric did repel water for a short while in quite a heavy shower and did dry very quickly. There are also a number of various -sized pockets. There is one side unzippable pocket at each side - the right of which also includes a smaller pocket with a zip which is large enough for change or other smaller valuables. There's one zipped pocket at the back plus a cargo pocket and a lower leg smaller pocket also with a zip. Whilst the Geos may be OK for warmer spring or autumn days, there are better, lighter options if you do a lot of summer walking. 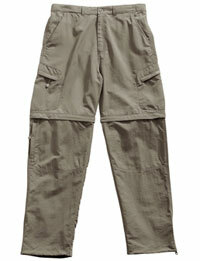 If you're new to walking and need a good value pair of trousers/shorts to start you off, then have a look at these. IMHO the sizing is a little eccentric so do check that carefully.